During the height of the DDT era, breeding ospreys along the Elizabeth River in Virginia disappeared completely. 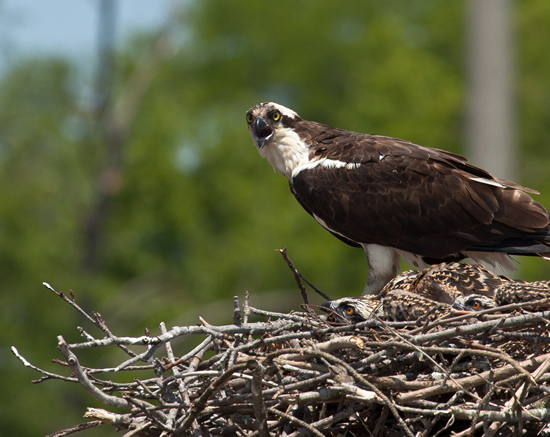 Some 30 years later, when the Center for Conservation Biology (CCB) surveyed the Chesapeake Bay osprey population, the tributary still seemed to be frozen in time. During the historic survey of 1995, only 8 breeding pairs were found. Unlike the other vibrant creeks, rivers and bays of the estuary where ospreys were thriving, piloting a survey boat along the Elizabeth gave an eerie flashback to the 1960s and 1970s. Like its sister superfund tributaries the Anacostia and Baltimore Harbor, the Elizabeth was a ghost town full of empty nesting structures. Bryan Watts (r) from CCB and Casey Shaw (l) from the Elizabeth River Project use an extendable mirror pole to check an osprey brood along the Elizabeth River. Photo by Marian Watts. In 2000 and 2001, wildlife contaminants expert Barnett Rattner from the Patuxent Wildlife Research Center collected egg samples from the Elizabeth River, Anacostia River, and Baltimore Harbor to compare to three “clean” tributaries. During this period, eggs collected within the Elizabeth still contained elevated levels of DDT derivatives and various industrial compounds. However, productivity was not suppressed and eggshell thickness, an outward indicator of pesticide problems, had nearly recovered to pre-DDT levels. 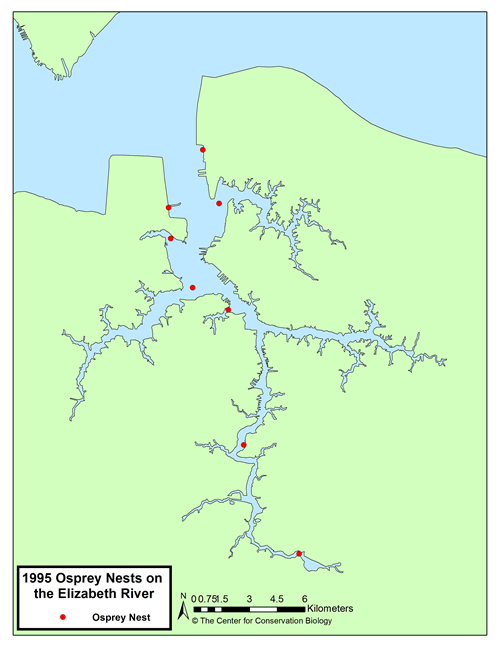 Map of osprey pairs along the Elizabeth River from the 1995 survey. Now, more than 40 years after the federal ban on DDT, osprey pairs are returning to the Elizabeth River in numbers. During the 2014 breeding season, CCB along with staff from the Elizabeth River Project resurveyed the entire tributary, mapping 60 breeding pairs and documenting 73 young. 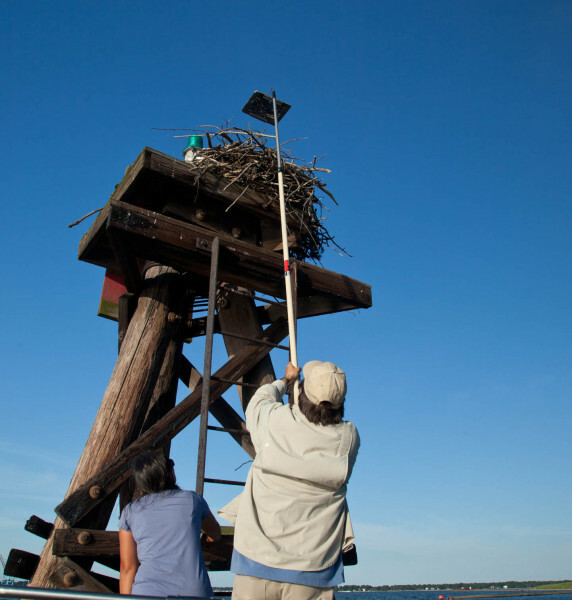 One of the more satisfying aspects of the population recovery to date is that 16 of the 60 pairs are nesting on osprey platforms erected by private citizens along the shoreline. Aside from the overall cleanup of the tributary, platforms are one of the most effective management tools we have for the breeding population. 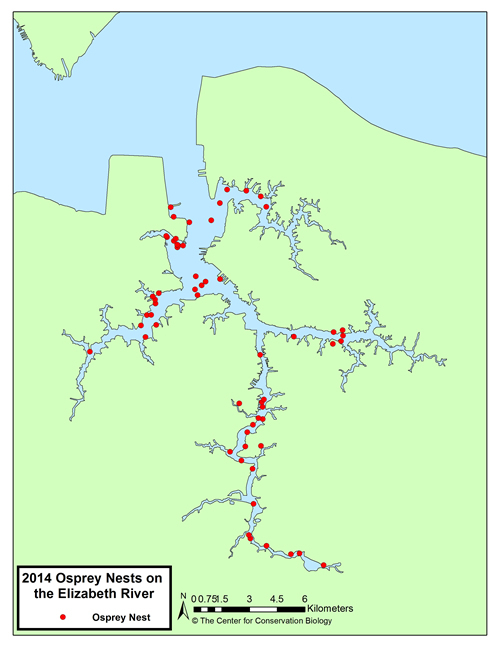 Map of osprey pairs along the Elizabeth River from the 2014 survey. Female osprey on nest with two chick brood. Photo by Bryan Watts. 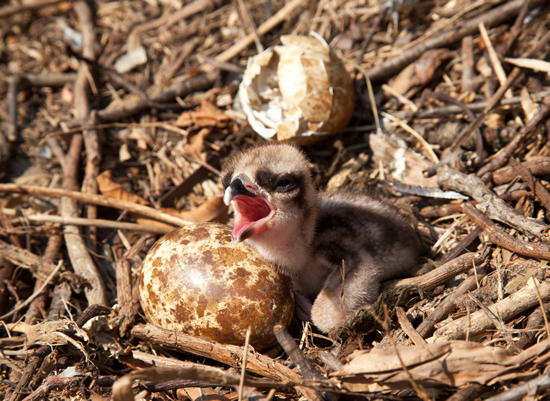 An osprey chick less than one day after hatching. Photo by Bryan Watts.